A state of the art dental laboratory has opened its impressive new premises at a former supercar showroom in our Albion Mills Business Centre in Bradford. PDS Dental, which employs 80 staff, has relocated its headquarters from Leeds into the sleek, modern workspace in Greengates, Bradford. The 14,600 square foot business unit, is now also home to a second laboratory, moved from Newcastle. Its new workspace will allow it to develop and expand its business into the future. PDS Dental has its laboratory in the former showroom floor area. Work had to be completed to run gas pipes to each of the lab desks before the business could open. The unit also has office space, a post room and a staff break out area. Plus work is underway to create a training area and two surgeries that will be open to the public. The site was first suggested to us by a friend of the family who also has a business at Albion Mills. At first I couldn’t picture how we would fit into a car showroom, but Brendan could see the potential straight away, and now it feels as though it was made for us. The business space was originally designed as a bespoke supercar showroom and conference centre. It was officially opened in 2008 by Sir Stirling Moss but closed in 2010 and since then enjoyed a number of temporary uses, including as a wedding venue and art space. 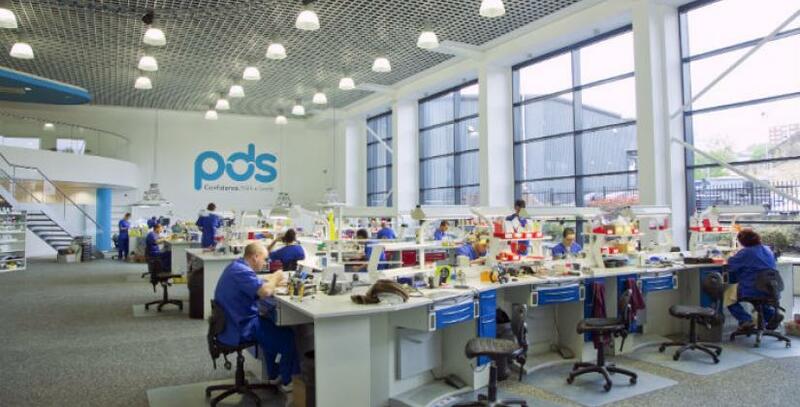 PDS Dental is a full service laboratory for more than 600 dentists in the UK, including Trusts and hospitals, providing implants, crowns, bridges, veneers, dentures, mouth guards and other products. But the firm, which is frequently hiring new technicians and apprentices, will soon welcome Changing Faces Dentistry and Facial Rejuvenation on site, which will treat members of the public. Work is currently underway on two surgeries, due to open in September, where patients will be able to undergo high end cosmetic dentistry and facial rejuvenation. The unit had such unique features and was finished to a very high specification, but because of its size it has taken some time to find the right occupier. For more information on Albion Mills Business Centre contact Shelby Maples on 01274 623 400.